This is the project website for Valuing Design, an AHRC (Arts and Humanities Research Council) project aimed at mapping design impact and value in public and 3rd sector organisations. The project ran from April 2014 to October 2014. The project report can be downloaded here. Our research insights have been derived from six case studies that were co-created with participants of service innovation projects. The projects covered a range of sectors including healthcare, mental health promotion, youth services and social care across England, Scotland and Australia. A scoping study conducted by the AHRC and the UK Design Council (2012) identified the need for academically sound research to understand the role, value and impact of design in service innovation. As the role of design expands from its traditional role of idea generation, visualisation and prototyping to also becoming a catalyst for change (Kimbell, 2015), the importance of articulating the value of a ‘design-led’ approach to innovation is crucial. What is a design-led approach? We have chosen a general term – ‘design-led approach’ as opposed to specific terms like ‘design thinking’ or ‘design process’ as a ‘catch-all’ phrase to describe the cognitive, social, emotional and physical activities linked to the act of designing. It encompasses the general (strategies & perspectives) to the more specific (methods, tools and techniques). We wanted a neutral term that could be interpreted in many different ways since we were interested in the participants’ understanding of the term ‘design’ and its associated values and activities. In all cases, we asked participants to describe their understanding of the term which was then triangulate and considered during data analysis. The term ‘design’ is contested territory (Nussbaum, 2011), and a number of perspectives, methods, tools and techniques we include in ‘a design-led approach’ are not exclusive to design, but cross-disciplinary: from management, sociology, ethnography, marketing and human computer interaction. We use the term conventional design skills (White and Holmlid, 2012) to describe the skills which have emerged from graphic or product-focussed design as described by Buchanan (2001). When these are combined with cross-disciplinary methods, such as ethnography, stakeholder analysis and customer-journeys, we describe this as a design-led approach. 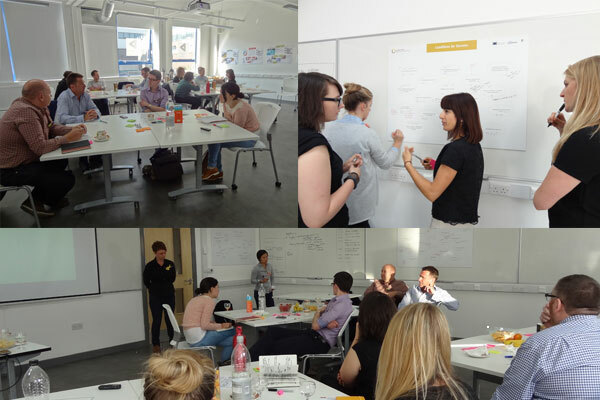 The term also enabled us to include projects that might be framed as Design Thinking, Service Design, Social Design or Creative Thinking projects which use similar ingredients, in different configurations. 1. What aspects of a design-led approach is valued? 2. What is the impact of a design-led approach? 3. What are the conditions for impact?